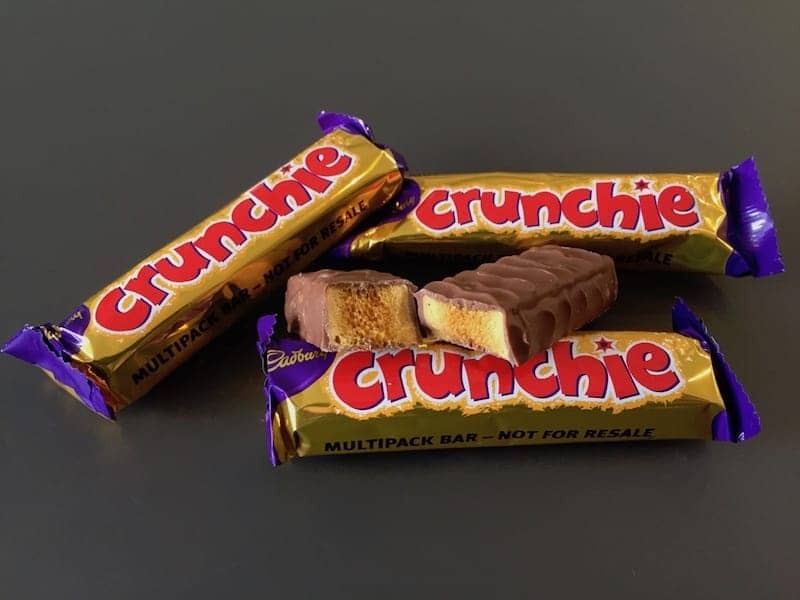 Originally a Fry's product and now one of Cadbury's classic bars, Crunchie was first launched in 1929. It is a chocolate bar with a honeycomb toffee sugar centre. During manufacturing, the honeycomb toffee is produced in large slabs and is cut up using a highly focused jet of oil to prevent it from fragmenting or dissolving. The honeycomb toffee is then covered with chocolate. The Crunchie got a literary mention in Enid Bagnold's book 'National Velvet' in 1935, as the Brown sisters' candy of choice for the year. Over a million bars are now produced a day. In the UK the Crunchie has been advertised since the 1980s with the slogan 'Get that Friday feeling'.